Former Fremantle Ports CEO Kerry Sanderson has been appointed the new Governor of Western Australia by Premier Colin Barnett on behalf of the Queen of England. She was the CEO of the Ports for 17 years and the Agent General in London after that. Now bring on the republic so we can get rid of the monarchy in Australia, and these archaic institutions, that cost taxpayers a huge amount of money. Well done Fremantle Society! The Freopedia QR Code history project conceived by FS in collaboration with Wikimedia was considered “one of the coolest projects taking place around the world” at WIKIMANIA, the annual WIKIMEDIA conference held in London(UK). Keep an eye out for the little plaques around town. Download a free QR code reader, zoom in with your smartphone camera, and read the historic information about the specific site you are standing at. Many more plaques will be installed in the near future, once funding for it is forthcoming. Delightful Fremantle artist Nellie Crawford is holding her next exhibition down south. Fresh from her success at the London Affordable Art Fair, where she sold all 5 paintings, Nellie Crawford is showing her latest work at Yallingup Garden Art Studios this Easter. The exhibition, which she will share with prominent Western Australian artists, Larry Micthell and Douglas Kirsop, opens at 6pm on Saturday 30 March and will be on show until April 10. If you’re down that way at Easter it will be worth checking out. It was disappointing that not more people came to the lecture on Mary Ann Friend at the Notre Dame University last night. They missed out on an excellent and engaging presentation about the young woman and her husband Matthew by the delightful Associate Professor Deborah Gare. Mary Ann Friend wrote a journal about her travels in which some of the earliest watercolour paintings of Fremantle are published. The diary will be on auction at Christies in London on October 10 and the Western Australian State Library would like to buy it. It would be fantastic to have the journal in W.A. but whatever the outcome of the auction I hope Deborah Gare will write a book about Mary Ann and Matthew Friend and their time in the Swan River Colony. Although only 30 people turned up it was nice to see two candidates for next year’s state election attending in Liberal Matthew Hanssen and Greens Andrew Sullivan. While I do understand the frustration of struggling Fremantle retailers, they need to be careful not to become one eyed about change and the protection of their own interests. Today’s whinge in the Fremantle Herald that the Mad Hatter Market at Kings Square is taking business away from the West End is a bit of a short fuse reaction, I believe. Those traders complaining are well advised to read the The Portas Review by Mary Portas on the future of our high streets. Although this was done in London, it has relevance to Fremantle. One thing the Portas Review highly recommends is free markets in inner cities, as they attract new people and business to town, and create vitality. 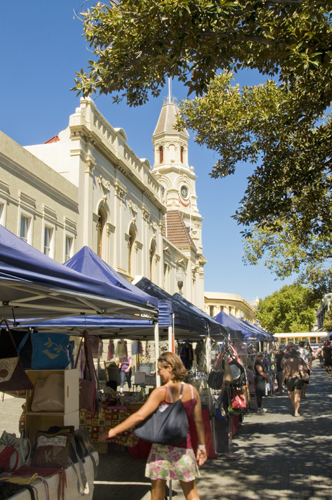 While retailers in Fremantle might only see the bad of the Mad Hatter Market, and possible loss of sales to market traders, it could also have a positive effect on the number of people coming here. The fresh food stall holders I just bought some steaks from tell me people from all over Perth come to their stall to buy meat. 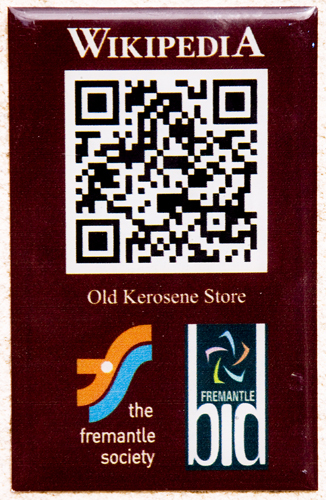 Hopefully they also stay in Fremantle for coffee, lunch or do other shopping here. YOUTH- IT’S THEIR CITY TOO! Consultation has been a key feature of Fremantle Council’s recent exploration of citizens’ views on its plans for the future city, specifically under what has come to be abbreviated to Amendment 49. A wide cross-section of the community participated, but one age-group has been overlooked. There is a movement in Britain that calls on the very young to have their say as well, called My City Too. It brings into the discussion on the city’s planning, youngsters aged twelve to nineteen. This initiative is an off-shoot of Open City, formerly Open House, an architecture association showcasing London’s architecture which has expanded into research, training, advice and to campaigns that impact the whole city. It is an independent, not-for-profit organisation that, “champions the value of well-designed places and spaces in making a liveable and vibrant city and the roles everyone plays in it,” including teens and pre-teens, largely overlooked until now. Open City activities extend to advocacy, education, activities and events, aiming to be, “at the centre of creating better places and a better city.” They describe themselves as championing excellence in design quality, advocating for an inclusive and informed approach to the development of their city. They involve a great variety of stakeholders across London, bringing together those who plan, design and build the city with those who live, work and play in it. They design programmes to encourage dialogue, debate and learning about how architecture and public space affect lives. So, where do children fit into this – and a campaign for votes at fourteen? Research shows that many young people feel that they have little or no influence in decisions about their city. It is their interesting insight, that young people must be fully involved in place making and policy-making if they are going to value, respect and take ownership of the spaces and places around them. Since the launch of the My City Too campaign in 2007, over 3000 young Londoners aged 12 – 19, have come together to develop a set of unique methods that can be used to involve young people in the design and creation of London’s urban environment. They seek to influence policy, create positive changes and raise awareness to the point of bringing young people’s ideas and research to a level where they can effect change. The aim is to promote young people in a public and professional environment and to show themselves in a different light, hoping to improve perceptions of young people by demonstrating the value of young people’s input. Methods include developing a manifesto, debating with Mayoral candidates, engaging with professionals and lobbying and working with local decision makers. Part of the campaign is for young people to have the right to vote in neighbourhood referenda on planning from the age of 14. They want to ensure neighbourhood forums are inclusive, not exclusive, asking Local Authorities and neighbourhood forums to sign up to a charter of principals that will help them to ensure equal access and participation for all groups living and working locally. “Young people have an impact on the city and the city has an impact on them. By including them in the process our neighbourhood designs will be stronger, more dynamic and innovative and ultimately create more liveable communities. Young people have a great deal of useful local knowledge and experience which should be used to make better places for everyone.” Has Fremantle’s consultation period really finished then? Comments Off on YOUTH- IT’S THEIR CITY TOO! A good Fremantle ISAF 2011 race this afternoon but the breeze still not strong enough, so lots of pumping going on. The grandstand was full and about sixty people watched from Bathers Beach, but the promised figures of visitors definitely have not eventuated. A man from the Dutch sailing team told me yesterday the last European events in Spain and Portugal only had such high ISAF numbers because tens of thousands of people were already in those countries for their annual summer holidays anyway. But 80 countries got live TV telecast from Fremantle today and supposedly billions of people all over the world were glued to their television screens, according to the official radio station broadcast. Before you point this out yourselves, I know that you are very tolerant and not racist and do have foreign friends, some even with darker skin than your own. All you were doing with your letters of course was only pointing out the obvious. Obvious to you was that there was clearly a racist, Muslim, migrant, and coloured element that started the London riots, and that shows that multiculturalism just does not work and is dangerous. This of course should then be a warning for Australia and we should stop all those foreigners from coming here. Our policies are too humane and those boat people only cost us a lot of money. Like you, dear letter writers, I too watched the news, read newspapers and listened to radio reports, but unlike you I noticed that the majority of people rioting were Anglo-Saxon, and God forbid might even have been Christians. I also noticed many were just schoolkids, obviously bored with school holidays, so a riot seemed a brilliant idea to have some fun. Police picked up kids who were just around ten years of age. On ABC radio this morning they played an interview with two young women with very broad London accents, who told the reporter it was all just quite fun and they wanted to show the police that they could do whatever they wanted. It was also great to have free drinks, after they had looted a bottle shop. So dear non racist letter writers, before you point the finger at minority groups, you might like to check your facts first next time and take your coloured glasses off, so you can see the TV pictures more clearly.